We never stand still here at Amped! The latest update for Amped FIVE (8006) is now available to download. I keep on saying this, but many of the updates have come directly from user suggestions. We listen to you and then put your suggestions to the test! If all goes well, then your help goes to benefit everyone. Some other points that we take seriously here at Amped are keystrokes, mouse clicks, and mouse movement. If we can find a way to reduce these then we do so… and you will see a few examples in this update. Sometimes, finding that filter can be tricky if you can’t remember what category it’s in. We now have a Quick Search bar within the Filters Window. Start typing the name of the filter and the suggestions will be listed alphabetically. Case Notes, information, or any text relating to your investigation can now be entered directly into the Notes Interface. 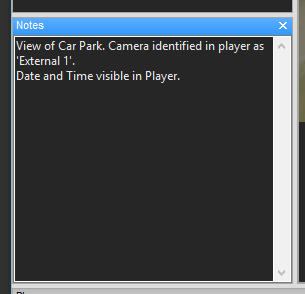 This window can be activated by using the Menu, View > Notes. All the details stored in this window are retained within the project file. It could be used to enter some details before sending the project for Peer Review. You could enter dates and times relevant for reviewing. You could enter more details on bookmarks. It is very flexible but enhances your ability to keep relevant information within the project file. When a window is active – it now highlights blue. This helps to identify what window is active, so your keystrokes and shortcuts relate to that window. Remember you can review all the shortcuts by going to Help > Keyboard Shortcuts in the Menu bar. The playback frame rate has been changed to Speed to avoid any confusion between the Change Frame Rate filter. You can increase or decrease the speed. The frame rate for the video is now displayed in the status bar at the bottom. A lot of filters have been improved in this release, in order to address users requests or make them more precise and intuitive. 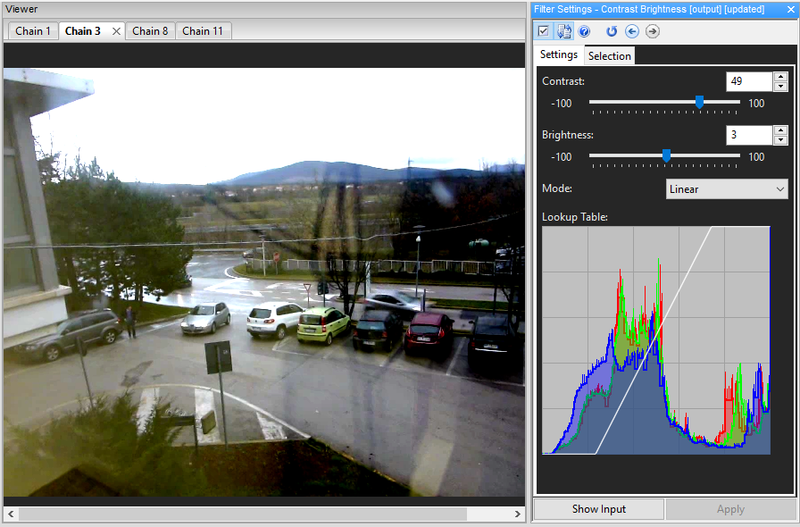 A number of additional Color Spaces have been added to the Filter Settings. This increases your ability to review an image within all these spaces in order to identify the detail required. The algorithms have been improved to enable a better automatic correction. These lenses are often seen in Pinhole cameras or bodycams. Even though we are firmly inside the Digital world, a great deal of our video still starts off in life as an analogue signal. 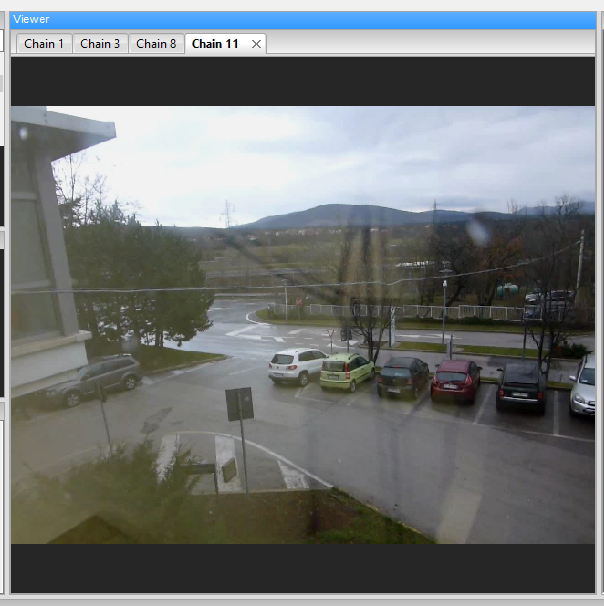 As such, having to deal with the effects of interlacing is a common task performed by Forensic Video Analysts. The algorithm behind the Deinterlace filter has been modified to improve the performances. Using the Fourier domain to visualize the frequencies in an image is a powerful tool to remove periodic noise. The output options for this tool have been enhanced with a new side-by-side view. The default tab choice has now been set to ‘Selection’. This ensures that you can choose your Selection immediately before altering the Settings. This is a simple change but removes a couple of mouse clicks, ensuring you can get your work completed quicker. The Image adjustment filters that utilize the Look-Up Table (LUT) to decode and present an image, now include a visualization of the LUT values within the Filters settings. This can really help in understanding the changes being made to the data when applying these filters. Following on from the LUT Visualization, the Contrast Brightness filter now allows you to select a logarithmic scale rather than a linear one when applying any transformation. This is very powerful as it takes the range of values into consideration to avoid saturation. 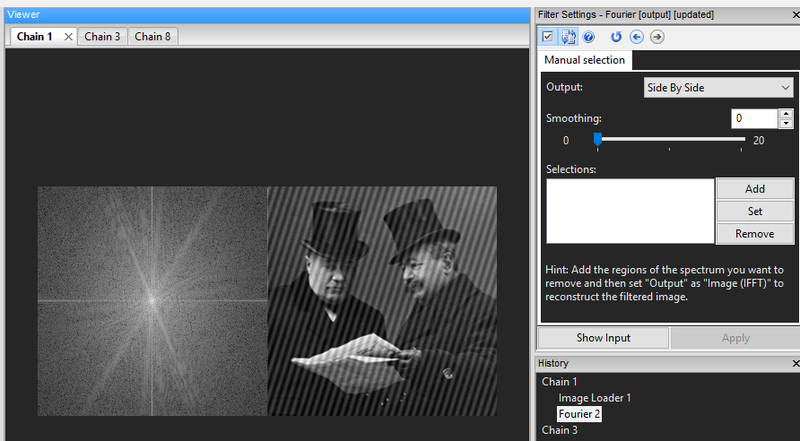 There are a number of Filters that require you to select different points in an image or different frames in a video. In order to speed up this process and avoid mouse movement, a new shortcut has been added. It is not case sensitive. A common error when measuring objects using Measure 2d, was to get the X, Y axis in the wrong order (I was very guilty of this one!!). As a result, a hint has now been entered in the filter settings to remind you that the X axis MUST be Horizontal. Many people were a little confused when they couldn’t see their files or projects when opening Windows Explorer from within the Amped FIVE Interface. This annoying little bug has been found and dealt with! Every now and then, you may have noticed ‘flickering’ on static text using the ‘Add Text’ Filter. All fixed now… no more dancing text! There were one or two translation errors within the interface when using a supported language. If you find any more hiding away – please let us know! 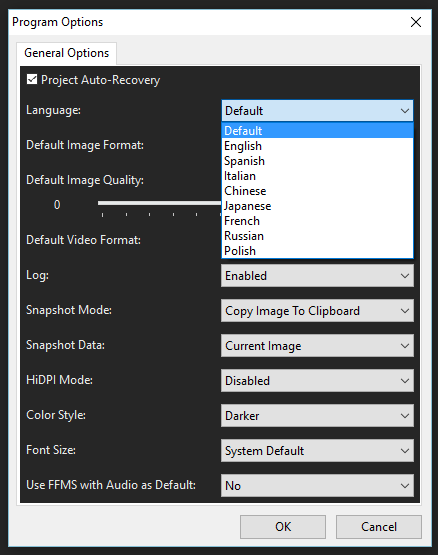 Languages can be chosen from the Program Options Menu. There are many more fantastic developments in the pipeline. Ensure you don’t miss out by updating today. This entry was posted in Announcements, FIVE, New features on April 15, 2016 by David Spreadborough.